Roma people outside their caves in Sacromonte . Angers in France in June, 1908. - annotated, "Bon souvenir". It’s said that people are hostile to what they don’t understand, or in some cases simply what they do not know. For many it’s the origin of racialism and perhaps over the years it could be the reason why Gypsies have been marginalised in Spain. Therefore any initiative to help open up the mysteries of the Calé community in Spain must be congratulated. Sometimes the opening up comes from inside the community itself. At the start of the nineties a group of Gypsy women from Granada formed themselves into an association called Romi. One of their main goals has been to set up a museum to explain the culture of the Gypsey woman, and now that goal has been achieved. 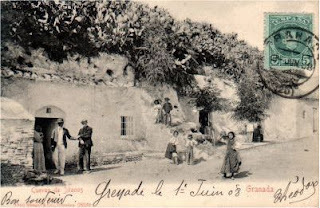 Three caves in the Sacromonte area of Granada now hold the very first museum to ‘La Gitana’ in Spain. Help from the regional government in the form of a 350,000 € grant has set up the centre, and the Mayor of Granada, José Torres Hurtado, has said that he hopes the centre will become a new tourist attraction for the city.